When the going gets touch, you may want to give the game up. Mobile devices have become the perfect breeding ground for rhythm games, and Give It Up! is one that will both enthrall and delight you as you push through it. However, its frustrating difficulty may come back to bite you in the end, so it's best to approach this one with caution. This is a familiar rhythm game with some interesting elements tossed in for good measure. You play a small, bizarre little cloud-shaped being as it jumps over pitfalls and other obstacles in time with a track that plays in the background. You must time your jumps accordingly, or it's game over. 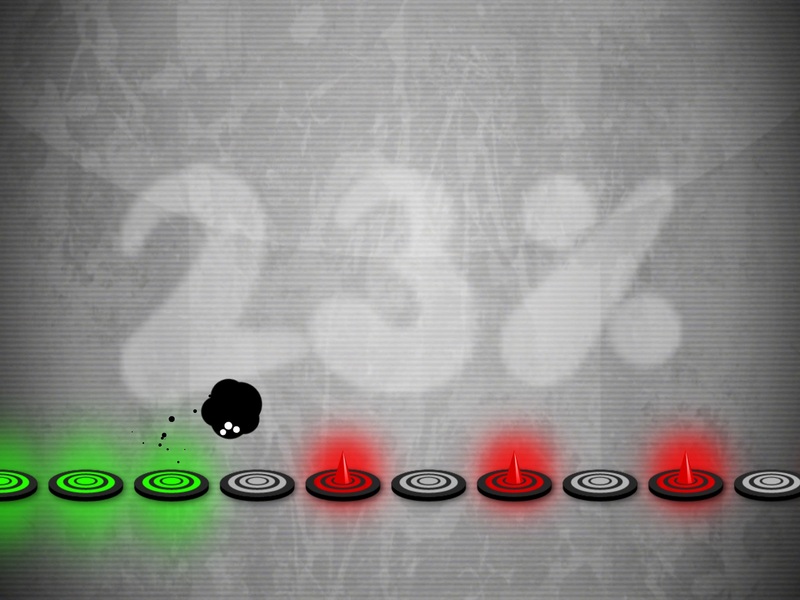 You'll complete a certain percentage of the level as you go along, which you can see in the background. Of course, you might end up jumping at the wrong time and failing, which means you'll have to start over. This can be very difficult to do, and quite challenging at various points, so you'll have to try and try again if you eventually want to see that fabled 100% popping up on your screen. If you're going to play a rhythm game, you might expect there to be more than one song to play along with after spending so much time with it. That unfortunately is not the case, as you're forced to play with one song throughout the entire game. Also, the game hardly changes from level to level, which can be outright frustrating given the fact that, even though it's just a dollar, you had to pay for this game. If it were free-to-play that model might make sense, but as-is, it's absolutely bizarre. There are better mobile rhythm games for the platform, even if you consider only the free titles. With one song to play, things get repetitive very quickly, and you'll want to play something else before you know it. Skip on this game and choose another rhythm title. You'll be glad you did.